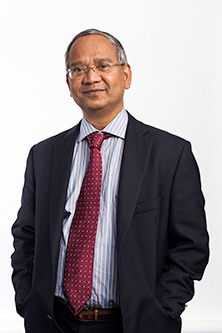 Research by Professor Aziz Rahman (pictured) and Dr Arti Agrawal of City's Photonics Modelling Group in School of Engineering and Mathematical Sciences, published in Applied Optics, has indicated that small deviations in segmented cladding fibre arising from the manufacturing process do not significantly alter the beam-splitting properties of the fibre. Segmented cladding fibres (SCFs) are highly sought-after materials in fields as diverse as medicine and telecommunications. They are used in high-power lasers, optical communication systems and mid-infrared sensing. The research analysed the birefringence or double refraction of light within an elliptical SCF, which can be altered by the number of segments used and the cycle of segmentation within it. Birefringence is the term used for splitting a beam of light into two, each refracted at a different angle and polarised at right angles to one another. The analysis employed an established method utilised in engineering and physics for realising very accurate characterisations of optical structures. Professor Rahman and Dr Agrawal demonstrated that a circular SCF possesses low refraction of light and that its segmented cladding does not add a significant degree of birefringence in an elliptical-shaped fibre. They said their result provides "a strong indication that small deviations in the segmented cladding parameters arising from the fabrication process do not significantly affect the birefringence of the fibre". The study was assisted by a UK-India Educational and Research Initiative (UKIERI) award. City's Photonics Modelling Group, led by Professor Rahman and Dr Agrawal, simulates the performance of myriad photonic and optical devices. A large part of this work relates to Microstructured Optical Fibres, in collaboration with leading international research groups.